Anodize USA pledges to provide practical solutions to today's complex anodizing dilemmas in the most profitable designs available. Anodize USA at your side assures your company of access to the latest technology advances in anodizing. Networking with the top technical individuals, provides our customers with the most accurate and valuable information sources available. We will sift through these advances to bring practical, usable and cost effective designs to your operation. Anodize USA can bring to your company’s metal finishing operation the forefront of anodizing industry. Andrew “Drew” Nosti is a hands-on nuts and bolts kind of guy with technical and practical experience when it comes to the anodizing world. 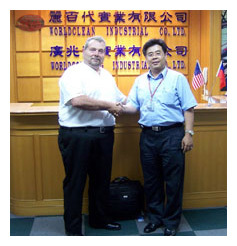 Having more than 35 years with the metal finishing industry, starting with coatings, plating and anodizing graduating to equipment and consulting, he is well respected in the business. In addition to equipment sales and consulting, Drew audits anodizing and other chemical processes for the aerospace industry. He contracted with a well known auditing team for the aerospace industry in 2005 swiftly becoming one of their lead auditors in demand. As an auditor he has been described as tough but fair and especially knowledgeable with regard to the process. To enhance his knowledge in the industry Drew was a member of the AESF for 35+ years in addition to becoming a member of AAC Hard Coat Committee and a member of AESF Light Metals Committee and served as co-chairman. His education started at Columbia High School in Maplewood, NJ moving on to Farleigh Dickinson University and CC Morris rounding his Metal Finishing education with the Garden State Branch Plater Course and later AESF Intensive Training and CEF exam. His thirst for knowledge didn’t stop at the doorstep of Metal Finishing. Drew had also trained in Disaster Housing Inspector for FEMA and completed a real estate course in South Carolina. He is active with most of the well known technical experts in the metal finishing industry and debates issues on a constant basis.